The blue part is handled by the U2F client (e.g. the web browser) and the green parts are handled by the U2F server library. U2F only works on HTTPS webpages. This section assumes that you are building a web site. If this is not the case, have a look at our U2F host libraries instead. Also note that Chrome is currently the only web browser supporting U2F. The main part of the client is to be a middle-man between the server and the U2F device. Register using a U2F device. 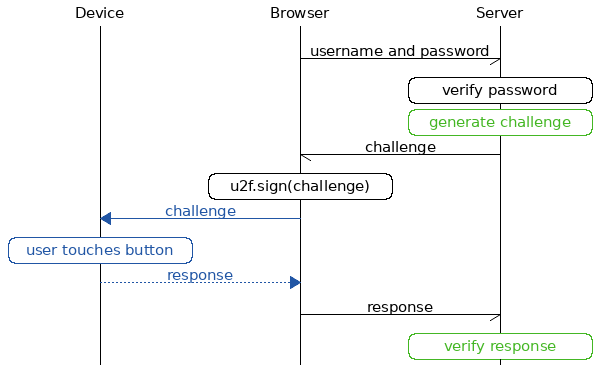 Authenticate using a U2F device. From the server (e.g. this row could be dynamically generated by the server). Send device response back to server. For a complete example, see this demo server. For complete example code (both server and client) in various languages, have a look at respective U2F library's accompanied demo server. If you get an error, check out the client error codes.